Famous for the groves of coconut trees from which it takes its name, Kovalam offers a long, white sandy beach on the Arabian Sea. Explore the numerous day-trip ideas around Kovalam: Thiruvananthapuram (Trivandrum) (Poovar Island & Vizhinjam Lighthouse). There's still lots to do: admire the striking features of Sree Padmanabhaswamy Temple, take in the spiritual surroundings of Sreekandeswaram Mahadeva Temple, relax and rejuvenate at some of the best spas, and don't miss a visit to Pazhavangadi Ganapathy Temple. To see more things to do, other places to visit, reviews, and tourist information, refer to the Kovalam trip planner . New Delhi to Kovalam is an approximately 5-hour flight. You can also drive; or take a train. Expect little chillier weather when traveling from New Delhi in June: highs in Kovalam hover around 36°C, while lows dip to 29°C. Finish up your sightseeing early on the 3rd (Mon) so you can travel to Thekkady. Centered on an artificial lake, Thekkady provides a sanctuary to a diverse set of animals and plant species. Thekkady is known for wildlife, nature, nightlife, parks, and spas. Your plan includes some of its best attractions: identify plant and animal life at Periyar Tiger Reserve, get great views at Chellarkovil Viewpoint, explore the activities along Periyar Lake, and admire the natural beauty at Green land spice garden. For other places to visit, photos, where to stay, and other tourist information, use the Thekkady trip itinerary maker site . Getting from Kovalam to Thekkady by combination of flight and taxi takes about 3.5 hours. Other options: drive; or take a bus. Wrap up your sightseeing on the 6th (Thu) early enough to drive to Pothamedu. On the 7th (Fri), see the interesting displays at Tea Museum, then admire the engineering at Mattupetty Dam, and then take in nature's colorful creations at Tea Gardens. Get ready for a full day of sightseeing on the next day: explore the striking landscape of Rajamalai (Eravikulam) National Park. Before you visit Pothamedu, use our trip planner to discover what you can do and see there. You can drive from Thekkady to Pothamedu in 3.5 hours. In June, plan for daily highs up to 35°C, and evening lows to 28°C. Finish your sightseeing early on the 8th (Sat) to allow enough time to travel to Cherthala. 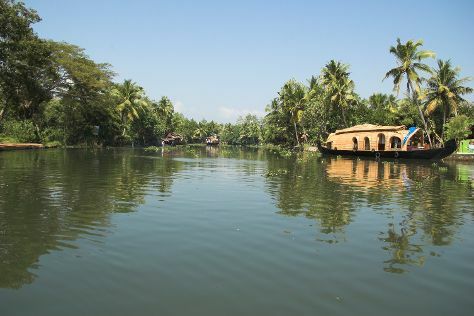 Kick off your visit on the 9th (Sun): look for all kinds of wild species at Kerala Backwaters. Keep things going the next day: pause for some serene contemplation at St Thomas Syro-Malabar Catholic Church ,Kokkamangalam, take in the architecture and atmosphere at St. Mary's Forane Church, and then take in the spiritual surroundings of Thiruvizha Sree Mahadeva Temple. For maps, traveler tips, ratings, and tourist information, refer to the Cherthala trip itinerary builder app . Traveling by car from Pothamedu to Cherthala takes 4.5 hours. In June in Cherthala, expect temperatures between 36°C during the day and 28°C at night. Finish up your sightseeing early on the 10th (Mon) so you can travel to Guruvayur. Guruvayur stands as one of the holiest and most important pilgrimage centers in the state, with its Sri Krishna Temple among the most frequented temples in the country. Kick off your visit on the 11th (Tue): contemplate in the serene atmosphere at Mammiyur Mahadeva Kshetram, take in the spiritual surroundings of Guruvayur Temple, take in the spiritual surroundings of Peruvanam Mahadeva Temple, then take in the spiritual surroundings of Shatrughna Temple, and finally contemplate in the serene atmosphere at Vadakkunnathan Temple. Here are some ideas for day two: contemplate in the serene atmosphere at Narayanamkulangara Temple, contemplate in the serene atmosphere at Venkitachalapathy Temple, then take in the spiritual surroundings of Paramekavu Bhagavathy Temple, then take in the spiritual surroundings of Kurumbakavu Temple, and finally stroll around Nehru Park. Plan my day in Guruvayur using traveler tips and tourist information provided by Inspirock. Getting from Cherthala to Guruvayur by car takes about 3.5 hours. In June, daily temperatures in Guruvayur can reach 35°C, while at night they dip to 28°C. Finish your sightseeing early on the 12th (Wed) so you can drive to Kochi (Cochin). A flourishing port city and magnet for the spice trade since the 15th century, Kochi (Cochin) proudly bears its distinct international influence and local Keralan culture. Kochi (Cochin) is known for historic sites, shopping, museums, beaches, and spas. 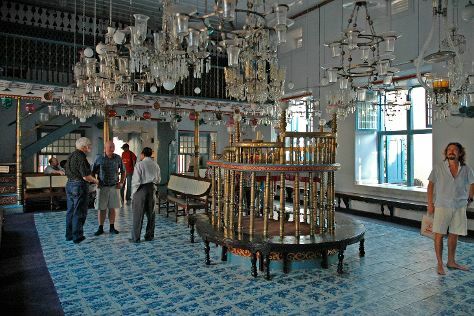 Your plan includes some of its best attractions: make a trip to Chinese Fishing Nets, buy something for everyone on your list at LuLu Mall, take a stroll through Jew Town, and admire the striking features of Mattancherry Palace. To see traveler tips, ratings, other places to visit, and other tourist information, read Kochi (Cochin) day trip site . Drive from Guruvayur to Kochi (Cochin) in 2.5 hours. In June, plan for daily highs up to 36°C, and evening lows to 28°C. You'll have a few hours on the 16th (Sun) to wrap things up before traveling home.